The wedding category provides the selection of WordPress themes that are designed specifically to build wedding-related websites. For instance, if you are a wedding organizer, you can use the themes from this category to build official website for your business. This way, you will be able to promote your wedding business in the best possible way. 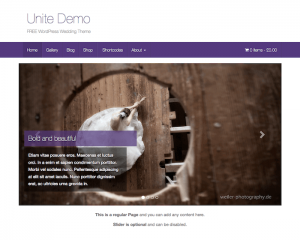 These themes are designed to be simple and to the point, with focus on providing wedding images and the accompanying content to enhance your wedding presentation. These themes can also be used by individuals who want to show their wedding events to their friends and relatives, as well as letting the world know about their wedding moments.